These stars make a nice gift, and also would be beautiful as a group project, with each child’s picture displayed. What You Need: 6 craft sticks, blue tempera or acrylic paint, glue, silver glitter (or glitter glue pen), magnet, photo. How You Make It: Paint craft sticks blue and let dry. Arrange 3 sticks in a triangle shape and glue together where they join. Repeat this with the other 3 craft sticks. Place 1 triangle on top of the other, rotated to form Star of David shape, and glue together. Once dry, use glue to “draw” along the star. Sprinkle with silver glitter. 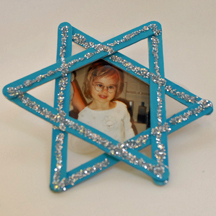 Once dry, use star as template to trim a photo to fit in the center of the star and glue or tape it behind the star. You can glue a magnet to the back, or hang the star. This entry was posted on Monday, November 19th, 2007 at 12:42 am	and is filed under Hanukkah crafts, Popsicle stick crafts. You can follow any responses to this entry through the RSS 2.0 feed. Responses are currently closed, but you can trackback from your own site.